- After a very strong year in 2016, we see that the export growth for salmon flattens out in 2017. The most important reason is a stable EU market. Increased consumer prices have led to reduced purchases of salmon in several of the major consumer markets in the EU, says Paul T. Aandahl, Seafood Analyst with the Norwegian Seafood Council. NOK 0.26 per kg higher than in 2016. Average export price for fresh whole salmon has varied in 2017 between NOK 72.07 per kg in January and NOK 50.51 per kg in November. Average export price in January was also the highest average price that has been recorded for an individual month. Norway exported 736,000 tonnes of salmon to the EU in 2017 at a value of NOK 45.7 billion. This is a decrease of 2 per cent, or 12,000 tonnes, in volume and an increase of 1 per cent in value compared with 2016. Approximately 73 per cent of all Norwegian salmon exports, measured in product weight, went to the EU in 2017. This is a decrease of 3 percentage points from 2016. 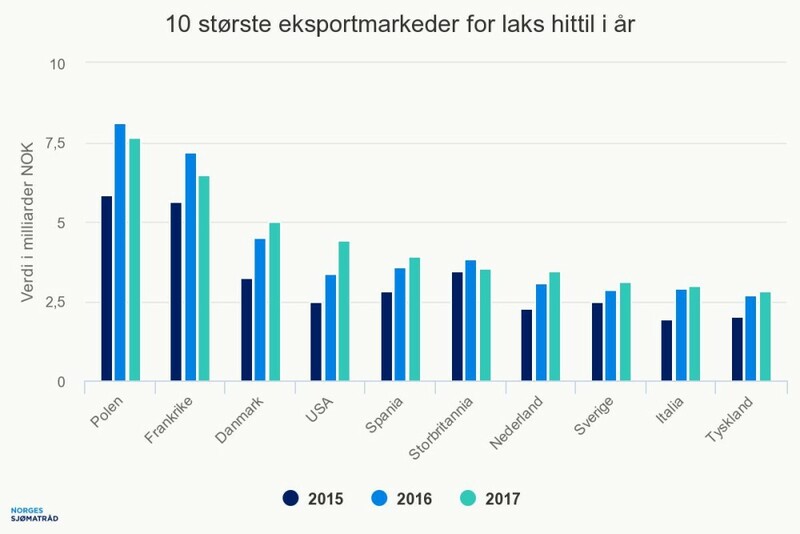 The largest markets for Norwegian salmon in 2017 were Poland and France. The export volume to Poland was reduced by 6 per cent to 132,000 tonnes, while the exports to France were reduced by 10 per cent to 103,000 tonnes. The largest growth markets in the EU were Denmark and Spain. The exports to Denmark increased by 15 per cent to 86,000 tonnes, while the exports to Spain increased by 8 per cent to 63,000 tonnes. Increased exports to the U.S.
Norway exported 49,000 tonnes of salmon worth NOK 4.4 billion to the U.S. in 2017. This is an increase in volume of 10,000 tonnes, or 25 per cent, and an increase in value of 31 per cent, or NOK 1.1 billion, from 2016. 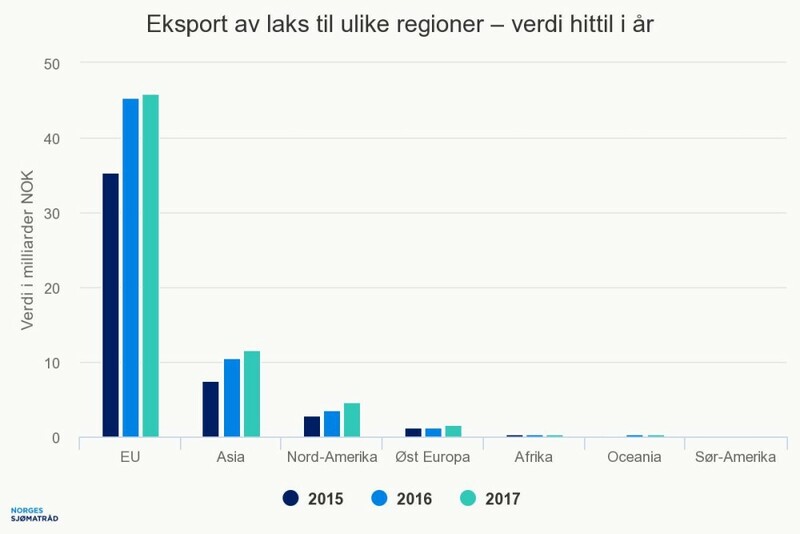 Norway exported 169,000 tonnes of salmon worth NOK 11.6 billion to Asia in 2017. This is an increase of 11 per cent from 2016. Measured in product weight, exports to Asia have increased by 13 per cent. The largest buyers of Norwegian salmon in Asia, measured in volume, were Japan, Vietnam and South Korea. Norway exported 40,000 tonnes of trout valued at NOK 2.9 billion in 2017. This is a reduction of 42 per cent or 28,000 tonnes in volume. The value was reduced by 27 per cent or NOK 1 billion from 2016. The largest markets for trout in 2017, measured in volume, were Japan, Belarus and the U.S.